Connect, Compete, Improve. It's a mantra that doesn't quite roll off the tongue, but will soon become exceedingly familiar to the legion of Call of Duty fans around the globe. The latest addition to the monolithic first person shooter franchise isn't a game at all. Instead, Call of Duty Elite is Activision's attempt at wrangling the disparate tribes of Call of Duty fans into a social network--and I couldn't be more pleased with the glimpse I was offered. I can already hear the murmurs from the audience, so we'll start with the important parts: Yes, it's a subscription-based service, and no, Activision offered no clues as to how much it will ultimately cost. But rest easy--the preview I received offered a look at some of the free features the Elite service has to offer, and it's shaping up to be a groundbreaking approach to building and maintaining communities around the Call of Duty franchise. Mere minutes into Activision's presentation on the Call of Duty Elite service, and my inner stats nerd is already giddy with excitement. Graphs. Beautiful, information-laden graphs, detailing every shot fired, every kill, every death--that last one is especially important for perennial "noobs" like me. When the Elite service goes live in November, the fundamental Call of Duty experience won't change. You'll still have your single player campaign, and can dive into multiplayer matches and frag ad naseum. The Elite service jumps in during the time between matches. 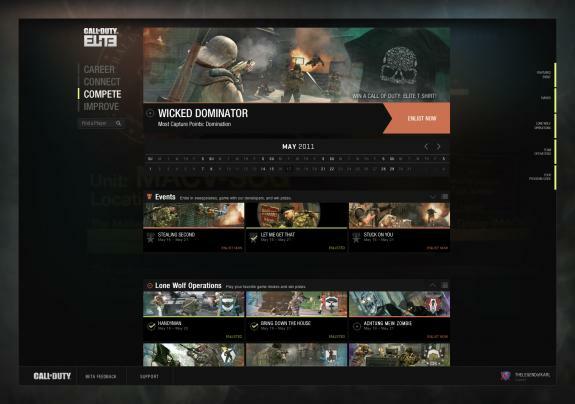 Available in-game, in a browser, and via iOS and Android phone and tablet apps, the Elite platform serves as a social hub to track your progress, study the inner workings of Call of Duty mechanics, and keep tabs on the competition. The website is split into four categories. First, there's the Career tab. 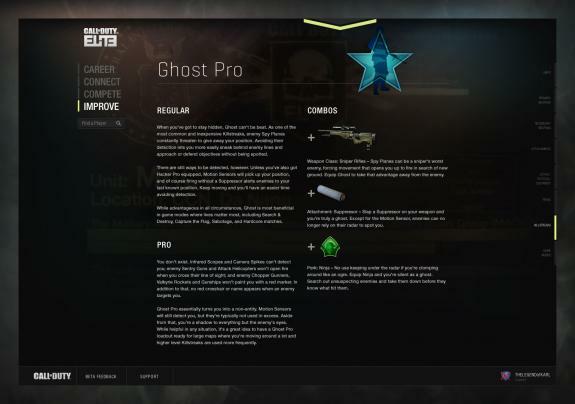 This page offers up an overview of your Call of Duty performance, divided by games; Black Ops for now, but including Modern Warfare 3 when that title arrives in the fall. You'll find data on your kill to death ratio, the amount of time you spent overall here--even a breakdown of particular match settings you've played. Better still, you can search for your friends (or foes), and compare stats. We're all familiar with leaderboards, where you can see your own progress ranked against the world. 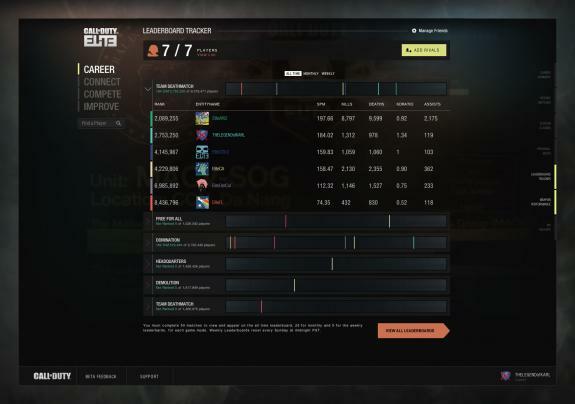 Elite will allow you to create custom leaderboards, consisting entirely of gamers you search for. This will be handy for keeping an eye on who's outpaced you, or simply for bragging rights. Next up is Connect, which is all about groups. Like Desktops? How about PCWorld? Slap both tags on your username, and you'll be grouped up with likeminded Call of Duty fans, with access to group leaderboards and quick matchmaking. There will still be robust clan support; groups serve as a casual way to get in on the action. The Compete category does what it says on the tin: Players will face challenges and are awarded prizes (real and virtual) upon successfully completing them. 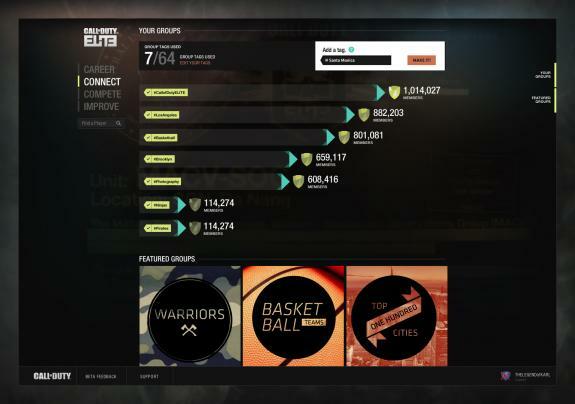 Operations serve as longer term challenges for players, groups, and clans to compete in, for prizes and bragging rights in the form of badges. One example: An operation that requires you to rack up a sizable number of kills in a 24-hour time period. Last up is my personal favorite bit: Improve. It's designed to turn scrubs like me into refined killing machines, by serving heaps of data on your play time. Like a particular gun? Tutorial videos will offer tips on using them, and you can check out your records to see how many kills you've earned with it, or how accurate (or inaccurate) you've been in the past. Having trouble with a particular level? Heat maps will show you where you've died and where you've made kills, offering you a bit more situational awareness. Activision didn't offer much information on what would be added once subscriptions are rolled in, though we do know that subscribers will have access to DLC releases. That said, if what I've seen remains free (and there's no reason to suggest otherwise) anything additional that's tacked on will simply be icing on the cake. We'll learn more about Call of Duty Elite later this summer, when Activision releases news on Modern Warfare 3's multiplayer component. Look for the service to arrive later this year, and stay tuned for coverage once the service's beta starts. Interested in gaming? Be sure to read PCWorld's Game On blog.